Telus White Pages - How do You Use it Efficiently? Find more stuff in Calgary. I used to have a copy of the Calgary Telus White Pages on my desk. This Telus phonebook measures 21.2 x 26.5 cm, is 44 mm thick, with 1200 pages and weighs more than 2 kg. 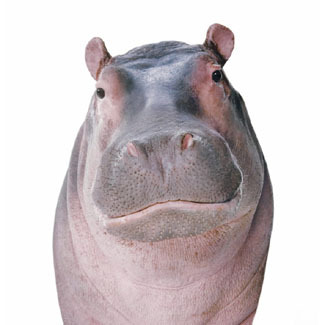 Not quite as much as the hippo from their old TV commercials (shown above) but close. I had another just like it at home. There are probably a million of these in print each year, and another million yellow ones twice as big. How many trees is that? I have a better idea. How about using their internet website at mytelus.com? On this web page, you can look up area codes or postal codes for both residences and businesses. Even better, if you have an address or phone, you can look up the person or business name by hitting either the "reverse address" or "reverse phone" text links. Can't do that with the paper Telus white pages. It works just like the old Henderson Directory of yesteryear. These functions are a little more difficult to work with, so make sure the information you enter is clear and accurate. The Calgary phonebook webpage also allows you to search for places that are close by. Say you wanted to find all the restaurants within walking distance, 600 m for example, of your hotel. Hit the text link for proximity, enter "restaurants" and the hotel's address. Then see what comes up. They will be listed in order of increasing distance. Be careful, though as some strange entries such as restaurant equipment and supplies may also turn up on your results page in this example. Who is behind these Telus white pages? A telecommunications company based in Canada. They provide land-line, mobile, cable and internet services, amongst others. The company evolved from Alberta Government Telephones, AGT, as a part of a grand deregulation process. Over the course of time, it also acquired clientele in British Columbia and eastern Canada. Like other large companies, problems occasionally crop up. Recent items include a labour dispute and tensions over sales of pornographic materials in 2007. They also provide the white pages and the mytelus website. They have become famous for their animal advertisements like the "hippotamus for Christmas" one referred to in the picture above. What's in the white pages Alberta phonebook? The white pages directory features some interesting stuff at the front. Emergency numbers first. Then Telus company information, services and numbers. Along comes a time zone map, area code listings and country codes. You'll find a first aid reference section, and more Telus information. That is the group of purple pages at the front. The pink and blue pages that follow include health and other government services, green ones for the environment.